Take a large saucepan out and pour the water in, setting the heat to medium-high. Once the water’s boiling, slowly whisk the grits in, turning the heat down to medium-low afterwards. Let the grits simmer for 5 minutes or until they’re tender. Stir in the cheese and remaining ingredients and serve right away ! The flavors seemed really subtle at first but once we added some additional salt, the flavors popped a lot more ! You can taste the Jack cheese first and foremost but you can taste the Cheddar cheese near the end of the bite. 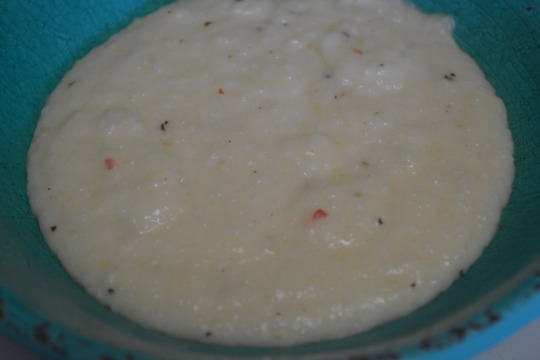 If you’ve never had grits before, this is a delicious way to be introduced to them !